NEW YORK, Feb 20, 2015/ — On Valentine’s Day, Christian Siriano made fashionistas fall in love all over again with exotic animal prints that he interpreted via graphical representations of the silver back gorilla and the Congo tiger. “The deep, dark and mysterious creatures from the Congo Jungle in the Central African Republic were my main source of inspiration for my Fall 2015 collection. I was drawn to the home of the silverback gorilla along with other exotic and exquisite creatures,” Siriano said in his press notes. Sending sleek burnout sleek burnout wool textured dresses, bold animal printed jacquard coats and liquid panther-like velvet evening looks on the catwalk, Christian Siriano captured a luxe and sophisticated feel for the collection while still being playful. Fluid silhouettes became counterpoints to the tailored more sculpted shapes as he interspersed plant life and the jungle itself via graphic oversized palms printed on taffetas and bright citrus embroideries. 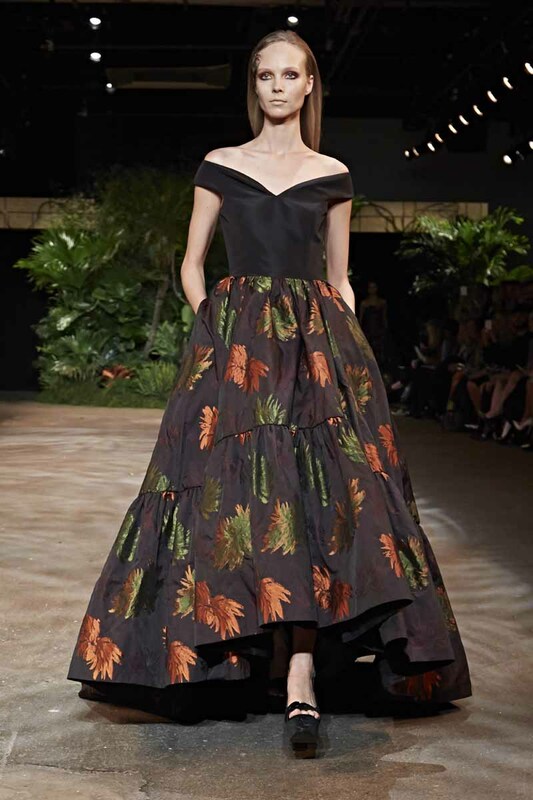 “I wanted this collection to feel elegant, powerful, bold but still romantic for the Christian Siriano woman this season,” said Siriano, who by the way did just that in this collection.